I was given a few items from LANEIGE to review. I love this line. It is top quality. No wonder it is one of the best exported Korean lines that exists. They are the top brand currently and are even sold at Target! This is a clarifying gel-clay mask, made from mineral mud and refreshing mint water, to remove pore-clogging oil and impurities. It is innovative and a pleasure to use, this watery, gel-clay mask leaves skin feeling clean, refreshed and free of debris and excess oil. It features Pore Minisizing™ technology, it glides smoothly onto skin, clearing impurities and reducing the appearance of pores. With a fast-acting formula, the mask dries quickly to absorb excess oil, say goodbye to shine! How to use: after cleansing skin, apply evenly across face, avoiding eye area and lips. Let dry completley and rinse off with lukewarm water. Use enclosed sponge to remove remaining residue. Use 1-2 times a week when skin needs it. I thing this is best for normal to oily skin and acneic skins. 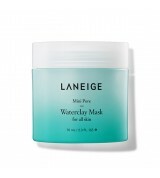 Now that my skin is starting to produce a little bit of oil this spring, I can use this kind of mask once a week. It will help to keep my pores clear of debris that seems to build up our of nowhere. I keep my skin well exfoliated, so I imagine that most of this is due to the change in seasons. Well, this mask will be a great help in keeping the blemishes down. 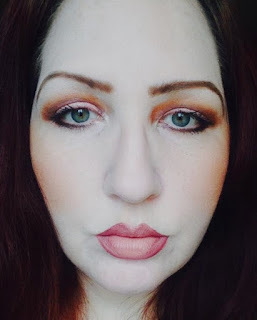 I have been loving these foundations that come in the cushion form. They are light enough for my skin, have coverage that can be built up from sheer to medium and usually have a beautiful luminous finish. 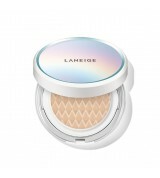 BB Cushion Hydra Radiance from LANEIGE is a radiance-enhancing, ultra-hydrating version of LANEIGE's global award-winning BB Cushion, this features Melacrusher™ and double-coated pigments that instantly brighten and moisturize. It includes a full size and a full size refill and additional applicator puff. It is the ultimate in on-the-go beauty. It comes in 6 shades. The shades are: Porcelain, Beige, Sand, Cinnamon, Coffe and Cacao. I wear Porcelain. This foundation-forward version of LANEIGE's popular BB Cushion is a real "glow getter"! It also contains a broad spectrum SPF 50 that protects against UVA/UVB rays (octinoxate 7%, titanium dioxide 4.15% and zinc oxide 9.8%), The Melacrusher™ brightening technology evens skin and creates a luminous finish. It has double coated pigments, infused with micro pearls and moisturizer, to ensure long-lasting hydration and a flawless complexion. The cushion also features an exclusive Skin Fit air cushion and dense antimicrobial applicator for thin, even layer of coverage every time. Apply whenever and wherever you want, with no buildup or bother. Directions: Apply by pressing the puff into moistened sponge and pat onto face. Reapply throughout the day if desired. The key is to make sure the sponge is moistened, otherwise you will not get good coverage. I really like the coverage I get with this. It is pretty good medium coverage that actually covers blemishes and things that you want covered. Skin looks luminous and pretty. It is definitely a good investment if you like cushion foundations. Below are a couple of photos of me wearing the foundation. LANEIGE's BB Cushion Pore Blur is a little bit different. It is still a version of LANEIGE's global award-winning BB Cushion, but this one is a pore-perfecting, ultra light, oil-absorbing formula that targets shine and delivers a flawless semi-matte, soft focus finish. It includes a Full Size refill and an additional applicator puff. It comes in 6 shades: Porcelain, Beige, Sand, Cinnamon, Coffee and Cacao. I wear Porcelain. Are you ready for a "pore-fect" complexion? This foundation-forward version of LANEIGE's popular BB Cushion blurs pores and imperfections for instant flawlessness. It also has a SPF 50 that protects against UVA/UVB rays (octinoxate 7%, titanium dioxide 4.15% and zinc oxide 9.8%). It has oil-minimizing powder and Pore Minisizing™ blend of Pine Needle and Mint Water means skin stays fresh, with a semi-matte, soft focus finish. Features an exclusive Skin Fit air cushion and dense antimicrobial applicator for a thin, even layer of coverage every single time. Apply wherever and wherever you want, with no buildup or bother. Directions: apply by pressing the puff into moistened sponge and pat onto face. Reapply throughout the day if desired. This is another winner. It applies like heaven. You get great coverage from it and a wonderful finish from the cushion. Semi-matte yet just slightly luminous enough with the soft focus finish. Below you are going to see a couple of photos of me wearing the foundation. Can you see the differences in the foundation? Now this is cool. I have a love for lipstick, so to get two colors in one, it brings out my ombré side. These LANEIGE Two Tone Lipsticks are a split-bullet, high gloss/semi-matte lipstick that combines two complementary shades for a trendy ombré effect. A cult K-Beauty favorite for creating an effortless ombré lip. This fashionable high gloss and semi-matte formula combins two makeup artist-curates shades in one sleek tube. Available in 8 fun, trendy color duos, it features a custome oblique cut that delivers a youthful, fuller pout and a perfect gradation with every swipe. Directions: Gently push down the slider to reveal the lipstick. Place the darker color on the inner lips and the lighter color on the outer edges for instant gradient lips. Or you can do as I did, wearing one color lip on top then having a trendy ombré lip on bottom. These are wonderful lipsticks with great long-lasting color that does a perfect ombré look. I would highly recommend these. In the photos below you can see me wearing each of the Two Tone Lipstick I tried. 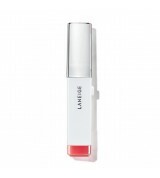 LANEIGE is available online at us.laneige.com. Like LANEIGE on Facebook:https://www.facebook.com/Laneige.USA?fref=ts; Follow LANEIGE on Twitter: @LANEIGEUS; Follow LANEIGE on Pinterest: https://www.pinterest.com/laneigeus/; and Subscribe to LANEIGE on YouTube:https://www.youtube.com/user/LaneigeUS.